Yeah, yeah … another strike out. So goes an inning on the big diamond of life. Still have my balls, though, and am happily stepping up to the plate. I’m ready to send any curves, sliders and sinkers lobbed toward me up, up and over the fence, yet patient enough to take a walk if that’s what will score and get me home. Yes, hope, like baseball, springs eternal, and with Spring on the way here in the Southern Hemisphere it is a perfect time to concentrate on things home, rather than away games, ignore crowds adoring the opposing team with little respect for fair territory and tag up. Thankfully, bats are deffo not lacking. Another ripe jack fruit in the tree at the bottom of my garden is the venue for flying fox fests that infuse the tropical night, typically tranquil, with a rollicking, rambunctious racket that have many a Seychellois thinking curry chauve-souris for dinner could kill two bats with one stone. I am a big fan of Pteropus seychellensis … the Seychelles fruit bat … and NOT on the plate. They put on one hell of a show of aerial acrobatics on a daily basis and add an element of drama to sunsets and rainbows. They’re also so cute. I know there are some who suffer from chiroptophobia and am guessing pointing out that fruit bats don’t fit the designation the fear of bats has in the Latin won’t make much of a dent in any phobic armour constructed over the years from bad movies and worse stereotypes. The fact that they have sweet little faces, not the monster-like visage of some of the more perfected insectivores since sonar isn’t their guidance system, does have me going all awwwwww over them, but others might be just a tad put off by the leathery wings thing. No matter. Even the most vampire-fearing reader should appreciate how interesting these animals are. The Seychelles is rather poor in the amount of endemic mammals. The two endemic mammals treated here are the two endemic bats of the Seychelles. Coleura seychellensis, Sheath-tailed bat. A small insectivorous bat (10g) that reside in caves. Present on mahe and Silhouette island. An extremely rare bat with possibly less than 50 individuals. Pteropus seychellensis seychellensis, Seychelles fruit bat. Almost black with rusty brown face and ventral side, and black/brown muzzle. A fructivorous species. Being the only endemic mammal in Seychelles, you’d think bats would be held in higher regard, but currying … unfortunately not with favor, but flavoring … seems to be the top praise they garner. 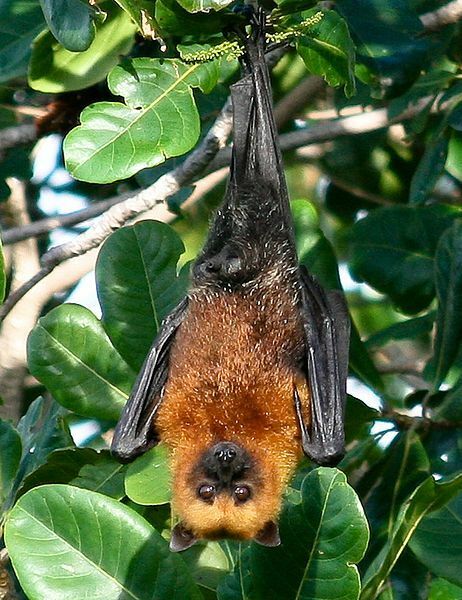 The Seychelles fruit bat or Seychelles flying fox … is found on the granitic islands of Seychelles. It is a significant component of the ecosystems for the islands, dispersing the seeds of many tree species. 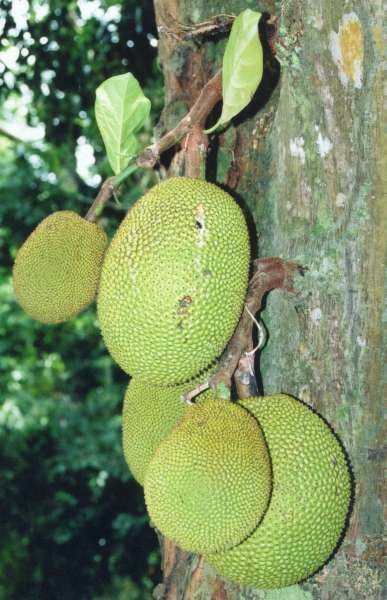 The huge jack fruit tree now serving as smorgasbord most likely began its germination in the gut of an ancestor of one of the cuties now scuttling across a branch, as did much of the fruit growing wild on this island. We can thank our little furry friends for making almost any hike on Mahé come complete with a snack somewhere, should one feel the need for a fructose boost. In researching info on our bats this morning, I found an answer to a question friends and I have asked many times while Anse wallowing over the years: Why do these guys tempt fate in daredevil dives seaward that see them skimming the surface of the Indian Ocean so closely that one false wingbeat will trap them? Over the past few years there have been anecdotal reports of Seychelles fruit bats ﬂying low over the sea, apparently drinking. These reports, by a number of different observers, always describe a single bat ﬂying down from a hill or mountain and dipping down to the surface of the sea. In none of the observations could it be determined for certain what the bat was doing and it was assumed that it must have been drinking. Observations have been made from the islands of Mahé, Silhouette and Aride in different months of the year (including January, March and October) but always when the sea was calm. 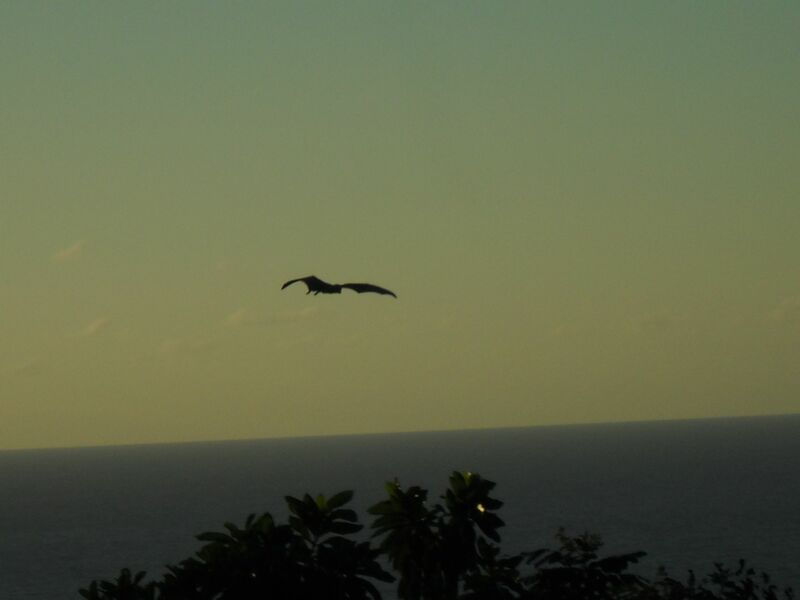 On 15th March 2002 a fruit bat was observed descending to the sea at Anse Patates, Silhouette island. The bat was observed from a boat approximately 300m off shore, and was estimated to be 150m away from the boat and an equal distance to the shore. Sea conditions were calm, with no air movement. The bat dipped down to the surface of the sea 4 times in the space of 2 minutes (13:07-9hrs). Due to the proximity to the bat it was possible to see that as the bat descended to the surface of the sea it dipped its breast into the water. The head was raised slightly, preventing the mouth contacting the sea. The behaviour was observed frequently in 2003; several times off the coast of Praslin and in March 2003 at least 8 bats were seen dipping down to the sea at Anse Mondon on the north coast of Silhouette. This included one bat making three repeat ﬂights to the sea. All these bats were roosting in trees along the coast. From these observations it is clear that the bats were not drinking but were deliberately immersing its fur in the sea. Salt-water immersion may be a strategy to remove parasites which would be expected to be abundant in a social mammal. Although this may be an effective way of removing parasites, bats using this behaviour may be at risk of falling in the sea, a risk which would be minimised by choosing exceptionally calm weather.